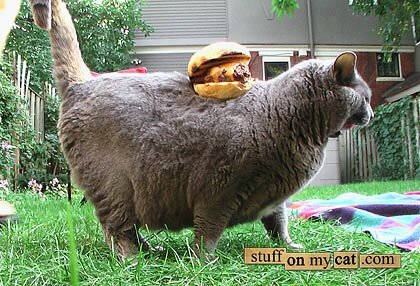 This cat has a burger on its back. Seems like a waste of a perfectly good burger. I could go for some barbecue right now, preferably not coated in cat hair. I was reminded of the cat Steph and I tried to save in college while scanning through the pictures on stuffonmycat.com. A cat somehow wandered onto the back porch of our first floor house apartment on Wilson. It wouldn't go away. We were not allowed to have pets, but we brought it inside anyway, and bought it some food. We didn't want to keep it long, as neither of us had money for cat food on a regular basis, and definitely didn't have the money for the pet deposit. We checked with everyone we knew, and no one wanted the sweet, pretty kitty. So, we decided to work out a deal with the Humane Society. We would leave the kitty with them to see if anyone would adopt it. Stupid, I know. Who adopts adult cats when they could have a kitten? But we had no experience in this area, as both of us liked cats, but were definitely dog people. (Funny side story - once, at a sleepover at Steph's house in 8th grade, her golden lab stole a pair of underwear out of another girl's bag and took them directly to Steph's brother, who was a few years older and very cool. Hilarious.) We asked the Humane Society specifically to put the cat up for adoption for 5 days (after that they kill them), and if they hadn't found a home by then, that we would come back and pick up the cat. We'd rather take our chances with the cat than have it killed. We left, hopeful that she'd find a great family. Boy, were we surprised when, after the five days, we called and were told that the cat had been killed. Dumb Columbia backwoods hicks. They waited three days, and without so much as a phone call, killed it. I demanded to know why, when we had left our phone number and specifically made it clear we didn't want the cat killed. They said it was unruly. I know this wasn't true, as we had kept it for at least a week prior to taking it in, and it had never once been unruly. I wrote a very nasty letter, and vowed never to support the In-Humane Society again. I understand people who get animals there. That's fine. But heed this warning - if you love your animal at all, and are forced to give it up, don't take it there. Please. It's a death sentence. We were both crushed. I guess I understand killing animals when they're not wanted. What else can you do with them? We'd be overrun. But killing one that had a last resort home - that's just wrong. I went back on my word, though, when donations in Steph's name were to be made to the Humane Society. She got her two babies there, who are now living with her sister. I did donate then. Now they won't leave me alone, but that's another story. I've always gotten my pets from the Humane Society. I didn't realize they only kept the animals for that short of a time period. It's sad. That's so extremely sad - what a horrible thing to make a mistake on. It sounds like the guy was pretty callous about it too. Spay and neuter, people - that's all I can say. It's horrible what these little guys go through - animals that are created solely to love people.